Some games are a stroke of genius. Others are more of a damp squib, cashing in on a licence or relying on a daft gimmick. This applies to board games just as much as computer games. Take Headache, for example, with the “pop-o-matic” dice system. It’s basically Ludo, isn’t it? Yet we own both. BOTH!!! Why? One game has been copied by TV and the puzzle pages of many newspapers and magazines, but NOTHING holds a candle to the original and best version of the game. 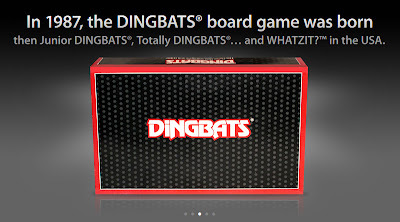 So what is a Dingbat? It’s a puzzle, essentially, based on word play. There’s usually no pictures, however letters, numbers, mathematical operators and shapes might be used. Usually the position or size of the letters is important too. But the answer might be a little bit less straightforward than you’d like. The most readily available example of Dingbats is the popular TV quiz show Catchphrase, with the motto “Say what you see”, but they’re usually blindingly obvious. A true Dingbat is slightly trickier than that. For example, what’s this one? OK, so you’ve got the word “Grass” there, in the middle is a plus sign. The only clue I’m going to give you is… WHAT is a plus sign, and WHERE is it? Think about it, I’ll give the answer at the end. The board itself is nothing too exciting, however the two piles of cards are the genius behind the games. Like most board games, you’ve got to get from the start to the finish, solving puzzles on the way (if you land on a puzzle space). There are two types of Dingbat puzzles, the Standard or “easy” ones, and the Diabolical, or “Stupidly obscure”. Like all puzzles, you’ll find there’s many that can be identified/solved in the blink of an eye, others that you’ll never get in a month of Sundays, but when you hear the answer you’ll be kicking yourself. Solving Dingbats is done against the clock, 1 turn of a 30-second egg-timer for the easy ones, 2 turns for the hard. 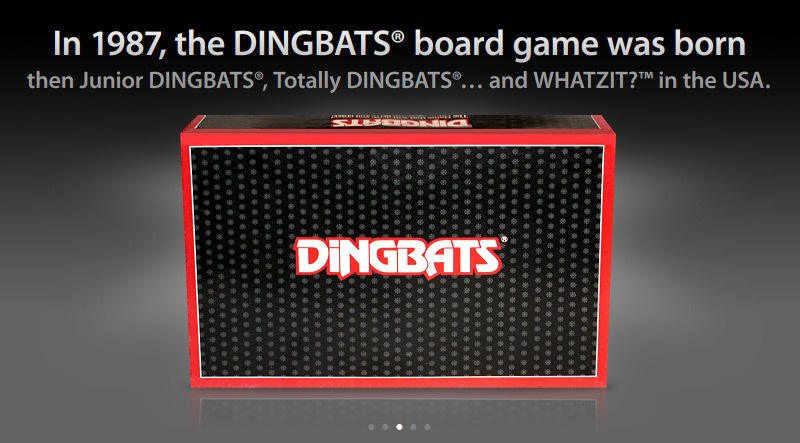 Some Diabolical Dingbats are played as “All-plays” where everyone tries to guess the Dingbat in competition. And… erm… well… that’s basically it. The winner gets to wear the “I’m a Dingbats Winner” badge, and there’s not much more to be said. Except, of course, you are in for hours of fun and laughter as you try to reach the end of the board. Those fiendishly difficult Diabolical Dingbats will have you shaking in fear, praying you get one you’ve seen before (but there’s a lot to get through! ), although we deliberately didn’t share the answer on those that weren’t guessed correctly. 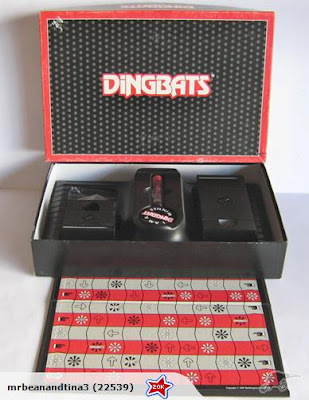 The concept of the Dingbats puzzle has been copied in magazines and puzzle books everywhere, however compared to the slightly off-the-wall nature of the true dingbat puzzle, they’re often far too easy, requiring 5 seconds or less to solve. 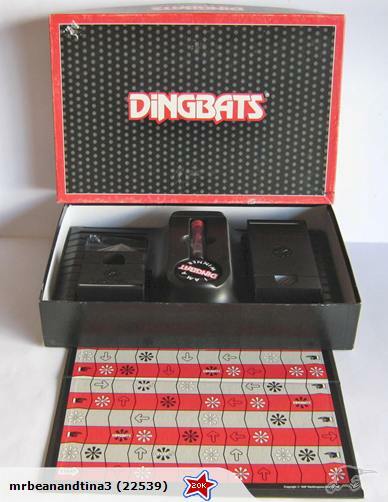 Dingbats – The Board Game… the original and best. Oh, the answer to the above Dingbat… “Snake in the grass”. Did you get it? I did get it! What do I win? I remember this from when I was younger, though I'd forgotten all about the badge! Those 'diabolical' ones were tough, weren't they? I had Junior Dingbats which went to far the other way. Far too easy. I was surprised to learn that the game is still going strong. There is even an iPhone app! snake................I don't get it ?? ?